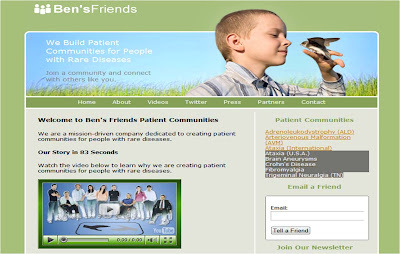 Our work on Ben's Friends, the patient to patient support networks for people with rare diseases, continues. Currently we have 5 owned and operated sites and another 3 that we have partnered on. We have approximately 3,000 members now and in January we had about 140,000 page views on the 5 owned and operated networks. Not too shabby for a couple of guys just trying to do their part. Last month, we were approached by the Brain Aneurysm Foundation (BAF) to help them start a support network for people with Brain Aneurysms and we succeeded in launching BAFoundSupport.org with them. This is a new tactic for us because we typically start the networks ourselves, but we felt like trying something new and BAF has been very fun to work with. If you or a loved one has suffered from a Brain Aneurysm, you are not alone. Check out BAFoundSupport.org. If you suffer from the conditions below, there are Ben's Friends support networks for you to find support at as well, and many more will be coming over the next year. If you would like to get involved or help us start another network for a condition not yet covered below, email me at scottorn(at)bensfriends(dot)org.